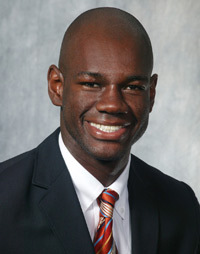 A Miami native, Jonathan Osborne attended college and played basketball at UNLV and the University of Alaska-Fairbanks. He then earned a Master of Arts in Communication Studies from UNLV and his law degree from Georgetown University Law Center. Jonathan currently serves as an Assistant U.S Attorney with the U.S. Department of Justice, US Attorney’s Office for the Southern District of Florida.